Keratoma (def): a rare, benign tumour of the keratin or horn-producing cells. The owner of a 16 year old Warmblood gelding, which was used for dressage, was worried that the gelding had been intermittently lame on the right foreleg for the past 6 weeks. 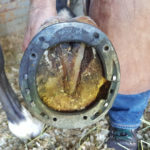 On physical examination of the hoof, the horse showed a very mild positive reaction when hoof testers were placed over the sole and high up on the outside (lateral side) of the hoof wall. No other abnormalities were noted. A palmar digital nerve block was performed and this showed a 60% improvement in the degree of lameness. When a nerve block was performed higher up the limb (an abaxial sesamoid nerve block), the lameness was eliminated and the horse was completely sound. 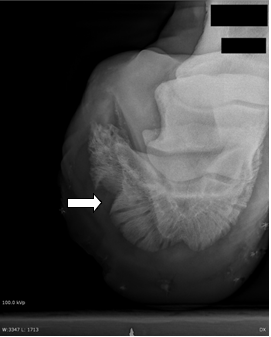 In order to ensure that the pain was not coming from the coffin joint (which would have blocked out in the same sequence as the abovementioned nerve blocks were performed), a direct coffin joint block was performed the following day and there was no improvement in the degree of lameness. Radiographs of the affected limb were performed over the area which had been isolated by the nerve blocks – that being the hoof and pastern area. Due to the fact that nothing abnormal was seen on radiographs, the decision was made to perform further diagnostics in the form of a computed tomography (CT) scan of the affected leg. 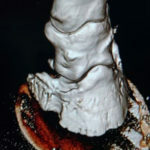 The CT allows for far greater imaging capacity of the hoof and structures within the hoof capsule (such as the small ligaments, P3 bone, navicular bone, navicular bursa, tendons and tendon sheaths). The arrow is pointing to an area within the pedal bone which has been “notched out”. This occurs due to the pressure which the keratoma places on the bone alongside it which causes resorption of the bone. This is considered the “classical” appearance of a keratoma on radiographs but was not seen on the radiographs in our case. The CT scan revealed the presence of a tubular mass of keratinised tissue on the outside (lateral side) of the hoof. It was found to have a small pocket within the mass which points to the presence of gas, and thus presumably an abscess, within that affected tissue. 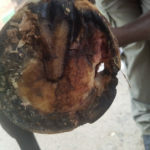 These findings are conclusive of the horse having a keratoma within the affected hoof. 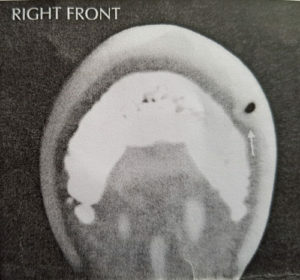 Right: View of the black spot within the keratoma – this is to show the presence of gas (which comes up on a CT image as black) within the mass. 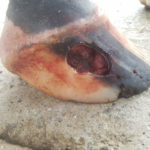 Keratomas are an uncommon finding in horses and occur when the soft tissue/laminae between the pedal bone (P3 or coffin bone) and the hoof wall grows abnormally and is filled with keratinised tissue. Left: a reconstructed 3D image of a CT scan from a different horse which also had a keratoma. The notch into the P3 bone can clearly be seen (indicated by the green arrow). Treatment for keratoma involves complete removal of this abnormal tissue mass. The surgical procedure can be performed under general anaesthesia or with the horse standing – this decision depends on the temperament of the horse and how extensive the keratoma is. In this particular case, removal of the keratoma was performed under general anaesthetic. 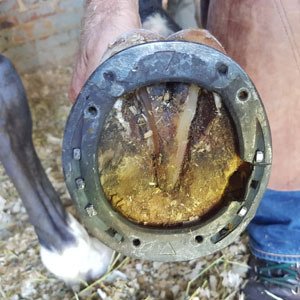 After the operation was complete, the open areas of the hoof wall and sole from which the keratoma was removed was packed with gauze swabs which were impregnated with antibacterial ointment. The hoof remained bandaged for a few days and thereafter a specially designed hospital plate shoe was made to fit the hoof. The hospital plate must remain on the hoof until the surgical sites have sufficiently granulated closed. Picture 1: The bar shoe in place. Note the notched out area on the right branch of the bar shoe which allows for access to the surgically removed area. Picture 2: An antibacterial impregnated gauze swab has been placed in the sole defect. Picture 3: An oblique picture showing the open tract from which the keratoma was removed. 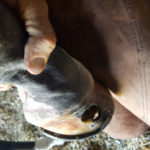 From the lateral side of the hoof wall you are able to see through the hole in the sole. Picture 4: The aluminium hospital plate has been applied. 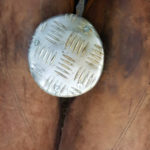 Small screws are used in order to prevent pressure points forming when the horse bears full weight. The aluminium plate wraps around the shoe and is bent up in order to provide complete protection of the sole area and prevent access of dirt, shavings etc to the affected sole. 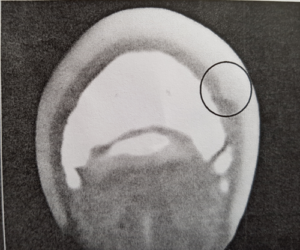 Keratomas have a favourable prognosis if they are identified early before too much distortion of the normal hoof architecture has taken place. Once identified, complete removal of the keratoma improves the prognosis for return to soundness and athletic career.